Dr. Alec Hochstein, the “iPodiatrist™” is a 1997 graduate of the New York College of Podiatric Medicine, and is currently in Private Practice in Great Neck, NY on Long Island’s North Shore where he lives with his wife and two children. Dr. Hochstein maintains a full time Podiatry practice, Great Neck Family Foot Care, with emphasis on Palliative Foot Care, Diabetic Foot Care, Orthotic Fabrication, Trauma, and Reconstructive Foot Surgery. 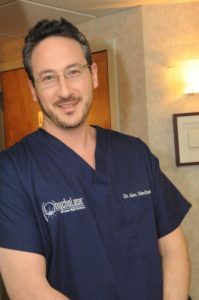 In addition to his private practice, Dr. Hochstein is also the Founder/COO of OnychoLase® Laser Nail Centers as well as Pocket Professions, PC. Dr. Hochstein is Board Certified in Foot Surgery by the American Board of Podiatric Surgery, he is a member of the American Podiatric Medical Association (APMA) as well as the New York State Podiatric Medical Association (NYSPMA). Dr. Hochstein is privileged to be actively involved in the training of future doctors of podiatric medicine at residency training programs in New York City and Long Island New York, including the prestigious hospital programs of New York Hospital of Queens, Albert Einstein School of Medicine and North Shore –LIJ Health System. Dr. Hochstein maintains other interests in areas of physical fitness and nutrition, as well as Internet technology, social media marketing. He has lectured both locally and nationally on various topics related to both medicine and technology in the medical office. Dr. Alec Hochstein is the creator of iPodiatrist™ – The Podiatry Profession in your Pocket iPhone / iPad App. Dr. Hochstein believes information technology is a powerful tool to motivate, educate, as well as communicate with students, practitioners and patients. Dr. Hochstein encourages his patient’s and potential patients to follow him on Twitter – @GNFamilyFtCare.